Prophet Muhammad sent these letters with the purpose of conveying the message of Islam to many tribal leaders and sometimes even to individuals living in various parts of the Arabian Peninsula. Khaybar, located in the vast valley which stretched from 180 kilometers to Madina’s north and on the road between Madina and Syria, was an important center of trade and agriculture populated by Jews. After the Treaty of Hudabiya, Prophet Muhammad began to take into account the threat that Khaybar posed for the Muslims. Mu’ta is located to the south of Lake Galilee, 50 kilometers from the city of Jerusalem. At the beginning of the eighth year after the Emigration (629 AD), Prophet Muhammad sent Harith ibn 'Umayr with a letter of invitation to Islam to the provincial governor of Busra, under the Byzantine Empire. With the conquest of Makka, the hostility of the Qurayshi polytheists towards Prophet Muhammad and the Muslims came to an end and the obstacles in the way of the spread of Islam in the Arabian Peninsula’s Hijaz region were lifted. The enmity between the Hawazin and the Quraysh, due in large part to trade relations and continuing from the Age of Ignorance had now been directed towards Prophet Muhammad – who was also from the Quraysh – and the religion of Islam that he conveyed. Ta’if became somewhat a safe house for the enemy. Hence, the Hawazin who were defeated at Awtas also sought shelter here. Immediately after the Battle of Hunayn, Prophet Muhammad decided to advance upon Ta’if with an army that he himself led. In the ninth year after the Emigration (630 AD), news reached Madina that Byzantine Emperor Heraclius had begun preparations for war against the Muslims, gaining the support of allied Arab Christian tribes such as the Banu Lakhm, Djudham, ‘Amila and the Ghassan. The ninth year of the Emigration (630-631) is known as the Year of Delegations (sanat al-wufud). The delegations coming to Madina on behalf of their tribes and meeting with Prophet Muhammad declared their acceptance of Islam, pledged allegiance both in their own name and in the name of their tribes, wanted to the learn the religion from the Messenger conveying it himself, and sometimes requested that teachers be sent to members of their tribes. 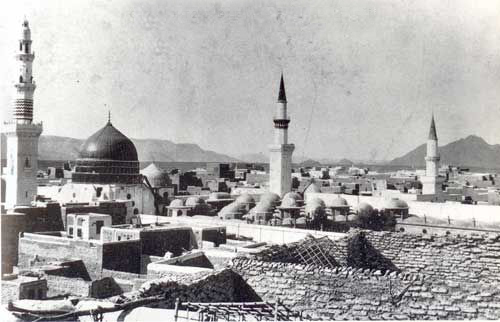 After Makka’s conquest, Prophet Muhammad made agreements with polytheistic tribes such as the Khuda’a and Mudlij – as he had made with those neighboring Madina such as the Damra, Ghifar, Juhayna and Ashja’ from the first year after the Emigration onwards – which ensured the freedom and safety of those visiting the Ka’ba for the major and minor pilgrimage and which guaranteed that no one would be in fear during the sacred months. Prophet Muhammad started preparations for the major pilgrimage and wanted all Muslims to attend.